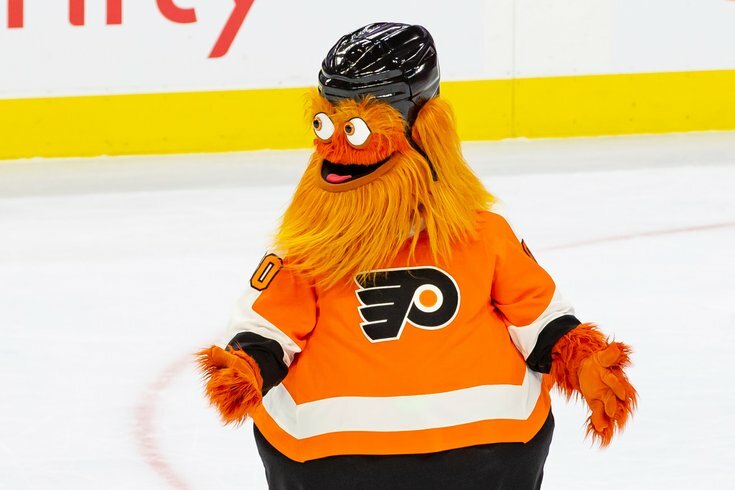 Philadelphia Flyers mascot "Gritty" during a game against the Arizona Coyotes at the Wells Fargo Center in South Philadelphia. ‘Tis the season for all sorts of holiday parties. You know, those gatherings where access to booze might lead to some things you might regret both professionally and personally. What a time to be alive! Some of those parties are formal. Those really aren't as much fun as they can be, if we're being perfectly honest. Many of them are freewheeling, though, and while it might not be for everybody with whom you share an office, having a mascot there could amp things up to 11. Yes, even this comes back to Gritty and his likeminded cohorts in the Philadelphia market. It'd be really fun to party with Gritty, the sane mind says to itself. Few fun things come without a price tag, though. So, the question becomes this: how much money do you have to lay out to get that orange monster to your soirée? With the caveat that it's probably too late to reconfigure your 2018 party plans, judging by demand, it'd be a grand idea to start planning ahead for the 2019 holidays. Since the local population is fractured insofar as university/college affiliation, we won’t bog this down with those mascots. (S/O to the University of Delaware’s YoUDee and its $75 to $500 price scale anyway). For the purposes of this post, we’ll focus solely on the local pro mascots, from the Phillie Phanatic and Gritty to Franklin, Swoop, Phang and Wingston. So, who's the most expensive? Well, we're sure you can guess the top two in Philly, but there's an affordability level here that could draw some interest for your kids' (or own) birthday parties. Still, a little birdie landed on my shoulder and told me that one of its clients tried to book Gritty for a holiday party but balked at the alleged $3,000-an-hour ask. I had to know whether that's the baseline. Turns out that it's pretty spot-on. Though there's a "Gritty Appearance Application" on the Flyers site, as things currently stand, the only way to book the googly-eyed hero for a private function is to purchase a group ticket package to one of the games. When we broached the prospect of a $10,000 group-sales buy, the spox noted that he could envision that happening while Gritty's hot, but it's not necessarily needed to get Gritty to your event, of course. Interested? Then give the Flyers ticket-sales team a call at 215-218-PUCK (7825). As the elder statesmascot of the market, requests for the Phillie Phanatic make their way to his offices at Citizens Bank Park with stunning regularity. Because of this demand, the big green being can’t really commit to events much more than a month ahead of time. Andrea Guest, manager of Phanatic events, said the going rate is $600 an hour, with the guest of honor galavanting about for up to 40 minutes. You can email the Phanatic's people at phanatic@phillies.com to put that request in. 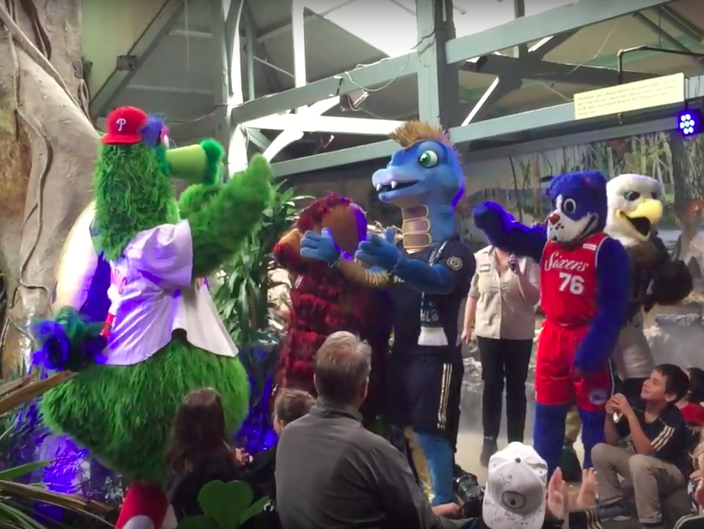 Mascots from several pro teams (and one from college) went to the Philadelphia Zoo on Monday, September 10, 2018 to welcome the Philadelphia Union's Phang the Blue Racer Snake to their exclusive club. The Sixers mascot appears on an "appearance request" list along with the team's dancers, dunk squads and others. However, there's no price listed on that page but Franklin the Dog's people let us know that his appearance fee runs anywhere from $450 to $650, subject to change. The Eagles’ mascot has its very own “appearance request form” for events ranging from corporate gatherings and grand openings to fundraisers and social events. The general fee is $400 or $200 for non-profits. Keep in mind that Swoop is required to take a 15-minute break and can only appear in costume for 25 minutes before taking that respite. Allie Gentile, grassroots marketing coordinator for the Philadelphia Union, pointed interested party-throwers to the “mascot appearances” page of its website. After confabing with the event organizer about issues ranging from date, time and location to whether the mohawked snake will have a changing room all its own, they check schedules to ensure Phang won’t be occupied at a Union match. If all things go right, Phang will be there for $250 an hour or $125 for a non-profit organization. 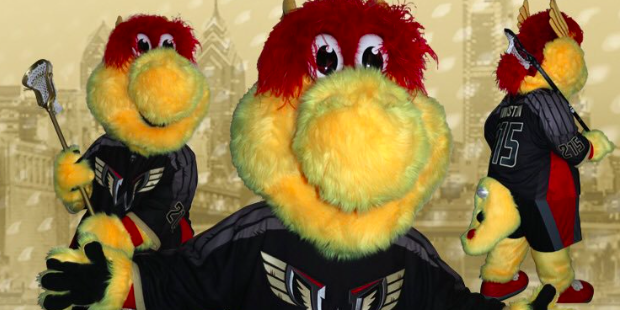 Wingston is the new mascot of the National Lacrosse League's Philadelphia Wings. As with Gritty, the mascot for the Philadelphia Wings (our professional lacrosse team, folks) is really new on the scene, so the "not set in stone" rule applies here, as well.